Moong dal halwa is a delicacy originated the state of Rajasthan. It is prepared from split yellow moong dal. 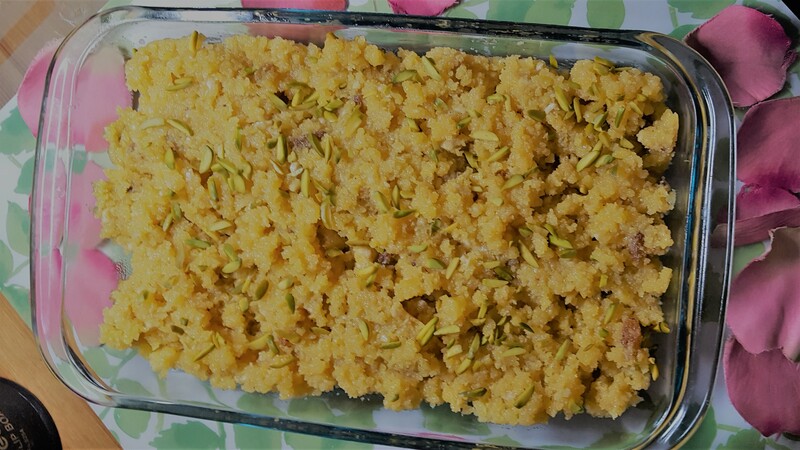 Moong dal halwa is very delicious dessert usually prepared during the winter months or on occasions.This recipe is coarse and sweet. This recipe is rich but very healthy, delicious and good for winter season. Soak moong dal in enough water for4-5 hour and drain very well, blend the moong dal in a mixer to make a coarse paste without using water. Place the moong dal paste into the muslin cloth and press it to remove water, hang it for 5-7 minutes. After that takeout moong dal paste from the muslin cloth into a bowl. Separate it with the help of a spoon, keep aside. Heat the ghee in a deep nonstick pan, add moong dal paste and cook medium flame for 15-20 minutes while stirring regularly. Take a pan add milk and water, and sugar mix well cover and cook on medium flame4-5 minutes, add this mixture in moong dal paste and cook on a slow flame for another 5-7 minutes, add the saffron milk and cardamom powder and all dry fruits mix well. Serve Moong Dal Halwa hot garnished with dry fruits.